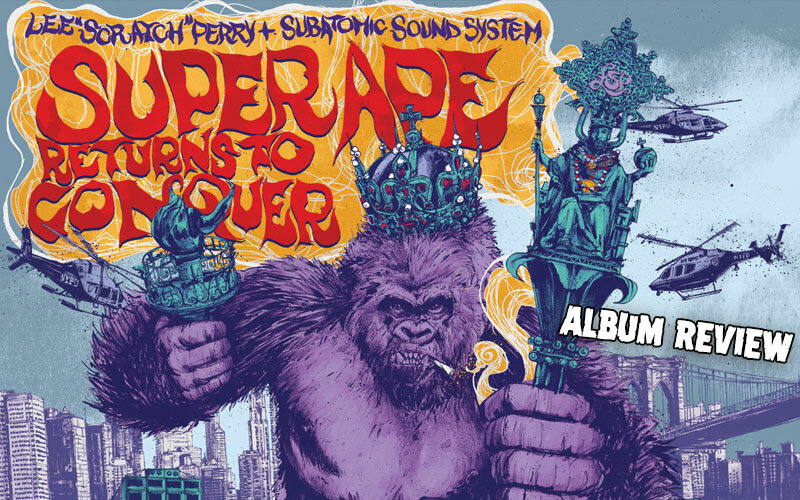 Leave it to Lee ”Scratch” Perry, the mad professor and father of dub, 41 years later to revisit his 1976 breakthrough, Super Ape, and still sound ahead of its time. On this take he’s joined by New York City’s Subatomic Sound System who has delivered a shaped-shifted performance all its own of the work originally of The Upsetters, his ace ensemble of his halcyon days at Black Ark Studios in Jamaica. To keep it simple, this return is not a track-by-track re-creation of Super Ape, and yet, in some ways, it is just that; and with the sequencing different depending on format (CD vs. LP) it’s best perhaps to offer a general overview of the effort rather than a specific breakdown. The elements of the original are all there in themes and melodies, but Super Ape Returns to Conquer is darker, dreamier than its predecessor, incorporating the spirit of the live performance of the material alongside iconic basslines and classic percussion. Additionally, Perry’s new vocal contributions pop in and out of most tracks, offering spacey footnotes to cuts pushed into a haze of smoke by puffs of Ethiopian horns and reverberating swirls of voices and sounds. A short, referential New Ark, Subatomic Energy leads the record into the group chant of Zion’s Blood. The original’s Croaking Lizard has been refashioned as Chase the Devil, featuring Jahdan Blakkamoore & Screechy Dan, still sliding in on the jazz riff first tallied back in ’76 by the legendary guitarist Chinna Smith. Next is a track that perhaps acknowledges most clearly the symbiosis between ’76 and ’17, on War Ina Babylon vs Black Vest, including both the current and ancestral titles. Again, this is why the comparing and contrasting the two is enigmatic, much like Scratch himself. If one was to listen to Super Ape, and follow it with Super Ape Returns to Conquer, the similarities would be obvious, yet not redundant. Nor is this a strictly modern update. Yes, there are contemporary guests like the aforementioned Blakkamore and Dan, as well as a cameo by Ari Up of the London female punk progenitors The Slits on Underground Roots, a reimagining of Underground. Still, this release stands alone as its own statement, reverential and progressive, due to the dedicated and observant work of Subatomic. Certainly The Upsetters were peerless as a group, backing The Wailers on what many consider to be Bob Marley, Peter Tosh, and Bunny Wailer’s finest work. Yet Subatomic Sound System manages gracefully and with innovation not only to honor that but project it and re-envision it with renewed power. This is largely a set based on minor-key arrangements and instrumentation, like chant vocals and echoing melodica, which require the room to affect. Perry and Subatomic are keenly tuned in to this, especially on the quartet of dubstumental mixes that close the set, and once again utilize these accents with lasting impact. Super Ape Returns to Conquer perhaps is best described as a brilliant companion piece to an album that still today is considered to be one of the highest achievements in the genre. Neither renders the other any less effective and, if anything, furthers the myths and majesty of Perry. At 81, he remains both mad and professorial, provocative and unpredictable.